Tony Campolo tells the true story of two men who were traveling together on a train in London. Twenty minutes into their journey, one of the men suffered a seizure, stiffening and falling to the floor. When this happened his friend immediately took off his own jacket, rolled it up, and put it behind the stricken man’s head. When the seizure was over, his friend lifted him back into the seat and cared for him. In one of the great, but simply stated verses of the Bible, we learn of God’s affection, commitment and desire to save us. Three profound Bible Truths are affirmed in this verse. Early Paul wrote, “All have sinned and fall short of the glory of God.” Indeed, “there is none righteous, no, not one” (Rom. 3:23, 10). The world views sin rather casually, almost humorously. But God doesn’t. Sin is an affront to God. It’s a violation of His Word. It’s unrighteousness. And ungodliness. Sin is serious. Sin enslaves the will. Sin stains the soul. Sin scars the conscience. Sin severs relationships. Sin separates us from God. The Bible says, “God is love” (I Jn 4:8). He is the essence of love. The epitome of love. He defines love. Unselfish love. Perfect love. Spiritual love. Love is a verb. And God demonstrates His love toward us in his actions. His love is demonstrable. Clear. Measurable. And abundant. Simply amazing. In spite of our sins. God still loves us. 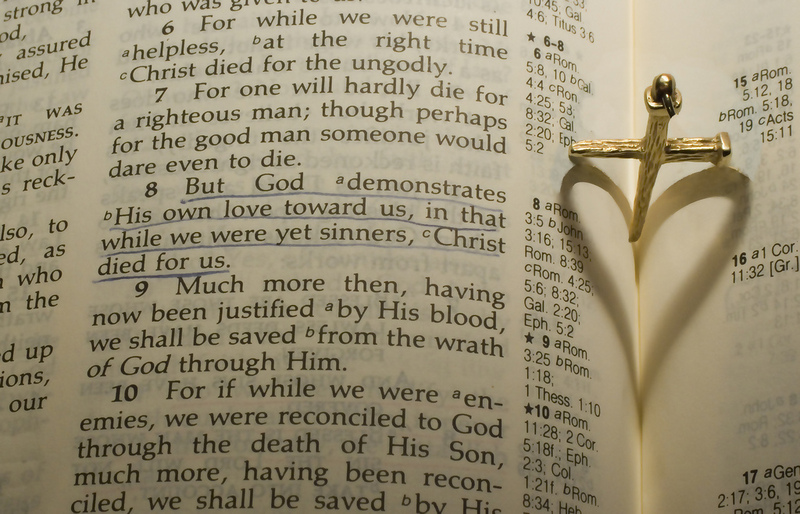 (3) Christ died for us. God forever proved his love through the sacrifice of His Son. Jesus came to earth as the God-man. He came to show us the Father. Live the perfect life. Provide for us the ultimate example. And then die a sacrificial death that we can be rescued from the deadly consequences of sin. Like the wounded solider in Vietnam, you and I have been wounded by sin. Through our own rebellion we wandered into enemy territory and were hurt by the sniper fire of Satan. We were dying. Hurting. Hopeless. Helpless. But God was there. He reached down. Picked us up. Carried us to safety through the strength of Jesus. His unfaltering, unfailing, and undeserved love was there for us when we needed him most. After all God’s done for us, if there anything you wouldn’t do for Him?